Do you have a Lawrenceville Ga swimming pool that needs help? Paradise Pool Services, LLC has been installing and replacing pool liners for over 30 years. We have we installed thousands of in-ground vinyl pool liners in Metro Atlanta and North Ga, with many of those being for our Lawrenceville pool owners. We’d also love to help you with your yearly pool opening and pool closing when that time comes. We’ll perform our 7-point inspection of your complete swimming pool system when we’re there doing your opening. If any problems are found with other parts of the system, we can typically get it fixed that same day. Paradise Pools has been in the industry in the Atlanta area for over 30 years. So, we’ve developed great relationships with the manufacturer’s and suppliers we deal with, allowing us to get top quality products at the best prices. We’re then able to pass along this quality and savings to our valued customers. Don’t delay getting that pool back in tip top shape. Contact us today so we can help you turn your pool into your own backyard paradise. We’re ready to meet you poolside to give your Free estimate on any type pool repair or renovation. 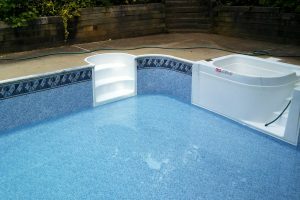 Paradise Pool Services does just about every swimming pool service under the sun. No matter what you may be needing for your Lawrenceville swimming pool, we can restore it to like-new condition again, ready to entertain guests.